Loading a horse into a trailer can be a tricky and time consuming task as even the most reliable of steeds can and will have an off day. When loading any trailer there are rules and guidelines to follow to ensure that it is well balanced and not going to have an excessive effect on your vehicle. 1. Make sure that the trailer is capable of handling the weight of your horse, not just the plated weight but also the condition of the box itself, make sure that it is sturdy and has a good solid base as this will give more confidence when climbing aboard. 2. Open all the windows and doors to make the space feel larger, and always allow yourself a walk through route to exit so that you don’t have to push back past your horse. 3. Allow your horse time to explore, if they feel comfortable they will be more inclined to take the first few steps by themselves. 4. Incentivise! Tasty treats will help to lure them that little bit further on board, however if they start to retreat don’t try to hold them, that is a battle you will lose and you may well pick up a few injuries in the process. 5. Use the correct bars and panels to make sure your horse is standing in the correct position when travelling. Any load should be as close to the centre line of the trailer as possible and directly over the axles. 6. 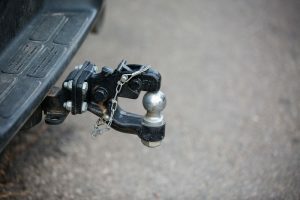 Check to make sure that your trailer’s nose weight is correct, if it is too light you will have to force it down to engage onto the ball, if it is too heavy you may notice a negative effect on grip levels at the front end of the tow car, this will affect acceleration, braking and steering. To check that the nose weight isn’t too heavy stand back from your vehicle and look at the space between the top of the tyre and the wheel arch, it shouldn’t be too different from front to back. 7. Make sure that the tow car has a large enough towing capacity for the loaded trailer, to do this you will need to find your vehicles identity/ weight plate (see website for details).